Ruan Transportation Management, only 69th in annual trucking mileage, is ranked by Transportation Topics as the 25th best transportation company, based on annual trends in revenue and number of employees. Though Ruan can't quite compare to the biggest trucking companies, like UPS, FexEx, Swift, or Schneider, it is categorized as a medium-to-large sized carrier with 1,752 vehicles in its fleet. Regardless of its market share, any company with so many vehicles on the road is bound to cause a few accidents. Overall, Ruan is a good company. It was founded in 1932 on the depression era values of integrity, hard work, innovation, quality customer service, and compassion. And for the most part, Ruan seems to live up to its values, receiving positive reviews from employees who appreciate working for a family-focused employer. But any trucking company, no matter its moral code, will inevitably make a few mistakes. Whether they hire the occasional bad driver, neglect to perform proper truck maintenance, or simply succumb to poor road conditions, Ruan Transportation Management is responsible for any collision caused by their vehicles and drivers. Cases involving Ruan tractor-trailers tend to revolve around settlement disputes - arguing over the exact value of the injuries sustained during an accident rather than determining who caused the accident. When liability isn't a factor, the identity of the defendant should hold no bearing over the outcome of the case. But the jury, as empathetic human beings, is understandably more likely to feel sympathetic toward an individual person rather than a big faceless company. For example, suing a sweet-looking grandmother would most likely result in a lower settlement value than suing a company like Ruan. Even people who respect Ruan are unlikely to feel any sympathy toward such a big, lucrative company. Therefore, trial values of personal injury claims are often higher against companies like Ruan, and this higher trial value indicates a higher settlement value. As a trucking company, Ruan's claims adjusters are accustomed to dealing with greater damages with larger dollar amounts than the average car insurers. Since tractor-trailers are much bigger and heavier than other vehicles, they cause more damage and devastation when they get into an accident. As such, the bias of Ruan claims adjusters can have a positive impact on settlement value. What Else is Different About a Claim Against Ruan? 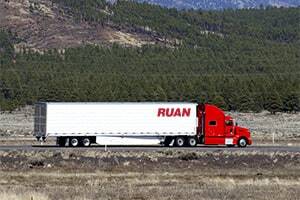 Ruan, like any trucking company, is required to follow a whole host of state and federal regulations for tractor-trailers or any kind of specialized equipment they might be carrying. Due to the specificity of the law regarding trucking, not every car accident lawyer is equipped to handle a case against Ruan. There are data-collection instruments onboard most rigs that collect and save data about their speed, airbag deployment, braking, and other data points from the time of an accident. Between this electronic equipment and the trucking-specific regulations, there are plenty of useful tools and data to use in a collision case against Ruan, if your attorney knows where to find them. There are also a number of tools on our website, designed especially to help victims learn about the possible range of the settlement value for their claim against Ruan. Looking at different settlement values for the same types of injury is especially useful, but checking out settlement values for the same types of accident may also provide some insight. Additionally, you can find samples of verdicts and settlements involving Ruan below. Although they may be limited in their ability to predict the value of your claim, these examples can help to broaden your understanding of how the settlement value can change based on jurisdiction, severity of injury, or economic loss caused by injury or death. Truck companies cause a lot of wrongful death and catastrophic injury lawsuits. These verdicts, albeit a limited sampling size, suggest that Ruan is no looking to try the most serious injury cases. We did not find any verdicts involving Ruan where the harm caused was death or catastrophic injury. Obviously, these verdict also show that Ruan is settling most of these claims before they ever see a jury. This is typical of most trucking companies. 2015, Indiana, $300,000 Verdict. The driver of a Ruan tractor-trailer rear-ended another tractor-trailer, driven by the 54-year-old male plaintiff. As a result of the accident, the plaintiff suffers from post-traumatic stress disorder, adjustment disorder, erectile dysfunction, and cervical and lumbar flexion/extension injuries. According to the plaintiff, the Ruan driver failed to stop within a safe distance when the plaintiff was stopped or slowing down for a red traffic light. 2013, Missouri, $203,500 Verdict. The plaintiff, and adult male farmer, was attempting a left-hand turn (with his turn signal on) when a Ruan tractor-trailer pulled into a no-passing zone and collided with the side and rear of the plaintiff's hay truck. The Ruan tractor-trailer pushed the hay truck into a ditch where it rolled once and righted itself. As a result of the accident, the plaintiff sustained a brain injury causing him bilateral parietal headaches, episodes of vertigo, balance problems, falls, dizziness, and cognitive impairment and deficits. He also suffered a slap tear of the left rotator cuff area and aggravation of underlying cervical degeneration and degenerative joint disease in his shoulder. 2012, California, $182,466 Verdict. The adult female plaintiff sustained rib fractures, an unspecified right shoulder injury, and emotional distress when she was struck by a Ruan tractor-trailer. She and her boyfriend were riding their bicycles through a public intersection at the time of the accident. Her jury award includes $123,000 compensation for pain and suffering, $29,466 for past medical expenses, and $30,000 for future wages. 2011, California, $30,000 Settlement. As a result of a rear-end collision with Ruan tractor-trailer, the adult female plaintiff sustained sprains and strains to her neck, upper and lower back, and right arm. The two minors also in the plaintiff's vehicle each suffered cervical, thoracic, lumbar, right elbow, and bilateral shoulder sprains and strains. The plaintiff quickly changed lanes to the right in order to avoid a stopped vehicle, and the Ruan driver was unable to stop in time to avoid a collision. The Ruan driver was allegedly driving at an unsafe speed for the road conditions. Our law firm is based in Maryland. Most of the truck collision cases we handle are in the Baltimore-Washington area, but we handle significant injury cases throughout the entire country. If you have been harmed in an accident with a Ruan truck and want to consider a lawsuit or a claim for an out-of-court settlement, call one of our lawyers at 800-553-8082 or click here for a free no obligation Internet consultation.